We got the results from test on Buddy's lump. The vet said it's a basal epithelial neoplasm, which as I understand, is a tumor. She said these are most often benign, but the plan now is to have it removed and sent to the lab for further analysis. Then we'll know better about what it was. So, Buddy's scheduled to go in on Monday for that procedure. Buddy's not stressing over it, instead he's staying toasty warm on Oliver's heating pad! Best of luck to Buddy, poor sweetie. Purrs and paws and fingers crossed that it's the usual, run-of-the-mill benign kind! purrs for you and Buddy.....it is much tougher on the people having to wait around for answers. Aww, purrs for Buddy. He'll probably have to get his neck shaved and have a nekked patch. Paws crossed for a clean bill of health! Purrs and more purrs for Buddy and mom and I will both be waiting to hear. xxxooo to him. Purrs for Buddy.. May the surgery be uneventful and the results be far better than you could hope for. Big big big purrs for Buddy. Wes all will be purraying hard for Buddy! And that heating pad looks marvelous...can me come share? 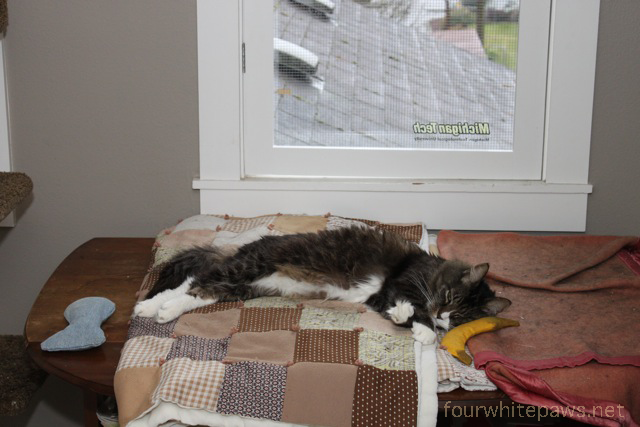 We will most certainly be purrraying that it IS benign...meanwhile Buddy looks rather relaxed with that nip nanner and heating pad.....we'll be anxious to hear an update Monday.